Hello Co-wheels Car Club Birmingham! Green Revolutions are operating Co-Wheels Car Club Birmingham as part of the Co-Wheels UK network. Click here for our Birmingham Car Club site. We want to encourage people to reduce their car use and use greener transport instead: Clean Air, Safe Streets, Healthy Lives. Sign up here for our free newsletter! Birmingham City Council have launched a consultation on a plan to help people get the most out of the city’s green spaces. The Green Living Spaces Plan will look at the vital assets that make up our green living spaces such as trees, woodlands, allotments, public open spaces, green roofs and walls, wetlands, canals and rivers. Good planning and maintenance of these spaces can bring many benefits, eg improved wildlife habitat, flood protection, climate and air quality control, a sense of place, good recreation areas, sustainable transport options and food growing. 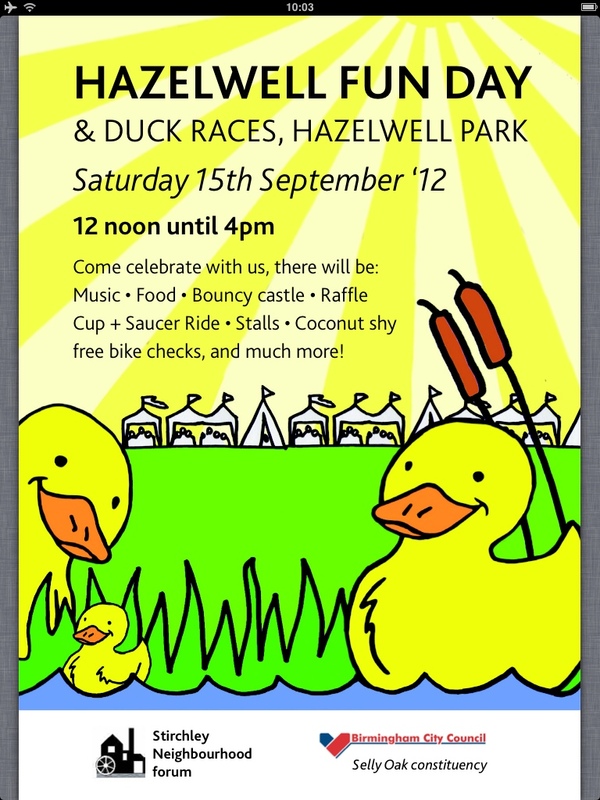 Hazelwell Park Fun Day is this Saturday!